Holstein Parade is one of the many cows ringing the outer edges of the Capitol Square and is located near the Wisconsin Veterans Museum. The Wisconsin Historical Museum can be seen in the background, as the two buildings are kitty corner to each other, with State Street angling off towards the UW campus between them. I do like it, though. It's cute. 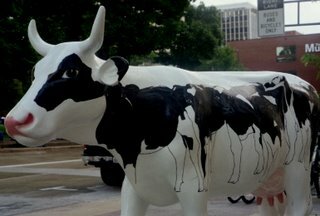 Yeah, from a distance she does look like a regular holstein - except, of course, no markings on her legs. 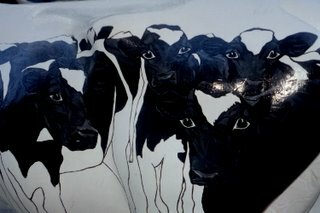 Can't drive from here to there in Wisconsin without seeing a holstein. Personally, I like the Scottish longhairs we pass coming in to work. They are definitely the cutest. 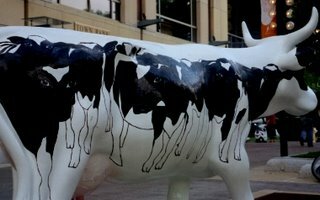 I cannot believe how huge this cow parade is! The Rise and Shine one below is really unique. OMG! This reminds me of my mom's kitchen.